Ben Helm is the project co-ordinator for Making Music Together, our new community project in the west end of Newcastle to provide opportunities for people to learn, play and listen to music. 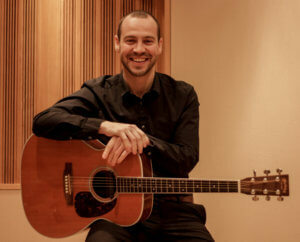 Ben is an educator, musician, band leader and arranger. He is primarily a guitarist but also teaches bass, piano and ukulele to all ages. As well as having a background in music and performance, Ben also trained to be a Speech and Language Therapist. He is fascinated about the relationship between music and communication, and continues to explore and reflect upon this in his teaching work and personal life. He is greatly inspired by the music of Django Reinhardt, George Benson, Martin Taylor, Chet Atkins, Claude Debussy and Steely Dan. Some of Ben’s most notable achievements include working with Nick Mason (Pink Floyd), performing at the BBC 6Music Festival and headlining the Sage Gateshead. He has featured in many local and national publications such as Q and CLASH and his work has received airplay on Radio 1, BBC Radio 2, 6Music, BBC Newcastle, and Amazing Radio. Making Music Together	Turn unused into useful!